Age: Right of the truck! I’ve been excited about this short-run release for quite some time. For me the most challenging wrapper to use and actually make an interesting cigar is the Candela wrapper. Most candelas I have smoked have not been that interesting (with the exception of the Camacho Candela). Nat Sherman, Graycliff, Camacho and Arturo Fuente are some of the few companies still making candelas. The wrapper refers to the color and process, not what type of tobacco it uses. For about thirty years in our history, Candela (or American Market Selection – AMS) was the most popular wrapper type used. The reason is most likely the process, which generally decreases the time from ground to cigar. Candela wrappers are basically “cooked” (up to 165 degrees), locking the chlorophyll into the leaf. Read this article for more history on this green leaf. Needless to say, you don’t see these green cigars much anymore. Age: Right outta the box! Fresh off his super hot Illusione brand, Dion Giolito unveils his newest creation, the Cruzado. Billed to be a more medium bodied blend than the Illusione, this blend has eagerly anticipated by cigar aficionados everywhere. They have just arrived at Empire Cigars and I grabbed the perfecto, called the Marelas as soon as I could. Here’s the write-up on the blend if you haven’t heard about it yet. One thing I like about the line already is that not one single size exceeds a 48 ring gauge except the perfecto. This will ensure that the wrapper’s flavor is more in the forefront than in many other blends. The cigar’s band seems to reflect a “knight’s theme”: gold, silver and black seem to give the impression you need some armor to smoke this cigar. The wrapper is thin and oily, with a reddish hue somewhere between maduro and Colorado maduro. The perfecto cuts well and the pre-light draw, to quote our buddy Larry, is like sucking through a big straw. The cigar takes a light easy and I am enveloped in a plume of rich earthy smoke. What strikes me in the first puff as I blow it through my nose: this is not a medium bodied or medium strength cigar! This is a flavor firecracker! The felling I get through my nose as I blow the smoke out is the same I get with a LG Diez. Right away the cigar is both sweet and spicy, loads of chocolate and spiced apple (that’s right – apple) compete for attention in my mouth. There are also hints of cedar and coffee present. As the cigar narrows the flavors get sweeter and richer, I pick up more cocoa and coffee with every puff with just a hint of anise on the finish. My only complaint is on the finish, which is really short. I want to savor these flavors even more! Just like the Cabaiguan and the La Riqueza are totally different cigars compared to the Tatuaje; the Cruzado is a completely different smoke than the Illusione. To me, the Illusione is earthy and rustic, while the Cruzado is crisp and refined. One thing that really stood out was that this cigar had just arrived; the guys at Empire cigars had just put them out and there was not one ounce of harshness or youth to the cigar at all. The blend is nearly perfect, reminiscent to me of a Cuban Romeo y Julieta Cazadore. Earlier in the year I said the Tabacos Baez was my favorite new cigar for the ’08-’09 releases. That was until now. The Cruzado blows it away. This has been one of the best new cigars I have tried since the debut of the original Tatuaje blend. Dion seriously knocked it out of the park with the Cruzado. To make things even more appealing, the price point on all sizes is under 9 bucks (at least in NC)! Pick one up (a box even) soon! 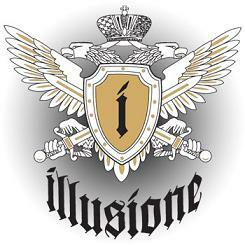 Illusione is a real hot brand right now, following in the tidal wave of the Don Pepin and Tatuaje Nicaraguan Revolution. This cigar is made in a tiny little factory in Nicaragua and has already obtained a loyal following. The ~m7~ is a Diadema (a tapered-down perfecto shape) and requires plenty of time to smoke it. It starts off real gently, not too strong, just a nice mild woodiness and a touch of pepper. Also present are toast and tobacco notes. The burn is very uneven, which for some reason is very common in these sizes regardless of who makes them it seems. As I smoke this big fella, I keep expecting some change in flavor and complexity but it never shows. Towards the end I pick up a little acidity, but that’s about it. Even though the flavors are good, this doesn’t offer me anything to get too excited about. This may just be a cigar I prefer in a small size. Sweet! My local store, Capital City Cigars, received a huge shipment of Illusione cigars! And after my ~mk~ review, I get to do a follow-up with one in their regular line, the ~2~, which is a stubby little torpedo. This little feller looks feisty. Short and stubby but a deep brown that exudes power and as I turn it to peer down the foot, I see a dense weave of ligero throughout the bunch. As I light it, I find myself a bit surprised. At first it doesn’t seem like it’s going to be as spicy as I thought and certainly not as spicy as the ~mk~ (which is a limited release with an extra oomph thrown in). Maybe this is like the Bolivar Belicoso Fino from Cuba? The BBF is a thick torpedo that sub-delivers on purpose and gives you a nice mellow mild smoke. As I smoke further I realize this is not going to be a BBF, but it will not be as strong as the little firecracker known as the ~mk~. This cigar actually has some sweetness, but there is also a mesquite meatiness to the flavor (maybe I should back away from the grill). But really, this is a sweet, meaty smoke, with just a touch of pepper and cedar. The smoke is voluminous and the ash is very flaky which is typical of a lot of Nicaraguan tobacco. The burn is mostly even though it does partially canoe in a few places. The really cool thing is that this cigar is so different from the ~mk~, which hopefully means this is the case throughout the whole line. As I smoke thru the halfway point, the cigar gets even sweeter and woodier. 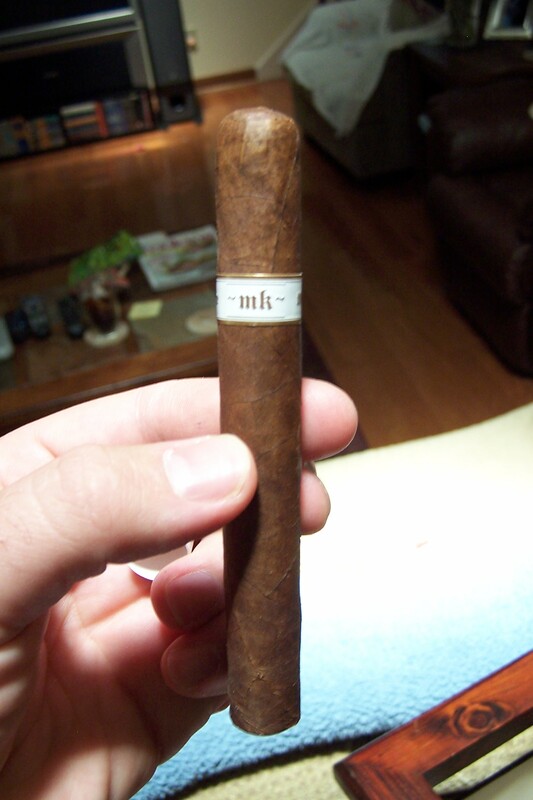 I am enjoying this cigar referred to “and crowned of thorns” from the Illusione website. The finish is nice and long and I pick up the standard licorice/anise notes at the end (this is pretty common as the cigar heats up, tar is produced which often gives off a licorice taste). I like this quite a bit more than the ~mk~, as I prefer refined to power. Great cigar! We have a hot one here folks! Illusione Cigars is a hot new brand that’s been getting the hype similar to LGC during the boom and more recently brands like Tatuaje and Don Pepin. They use Corojo ’99 and Criollo ’98 seeds to create this interesting cigar. Yes, some of the presentation and mystique surrounding this cigar is similar to Tatuaje, but that’s where the similarities end. The ~mk~ aka “The Teaching Machine” is a classic corona that has a throwback flavor. This cigar is very rustic in presentation and taste. The draw is slightly tight, but that’s OK for a corona, but the construction is perfect. The dark tight ash holds as long as you want it to and you are rewarded with bountiful smoke and one hell of a kick. This is not your daddy’s cigar. Rich pepper and spice abound with hints of leather and anise. This cigar is a powerhouse, both full in body and very full in strength. I bought an extra one so that I could put it down for a year. Can’t wait to see how this little firecracker will do with some age!